Have you ever met a really big sinner? Not the normal, everyday kind, but one with really big sins. The kind of sins you don’t even want to speak of. And when you met them, what was your reaction? Did you cross the street to walk on the other side? Did you stand in the corner of your workplace and whisper about the encounter? Did you criticize their looks, their love, their shortcomings, and their shames? Sin is not normal, no. But all too often, we treat sinners—especially the really big kind—as though they are less than human. And not just us, either. Even, for example, on Mt. Athos, the Holy Mountain, this sort of sin-shaming has been—at times—alive and well. In fact, I recently heard the story of a monk of Mt. Athos who, a number of years go, drank and got drunk every day. He was, as you might expect, a great scandal to all the pilgrims. Eventually this monk died, and many of the pilgrims were quite relieved. Some of these pilgrims even went so far as to tell the Elder that they were happy that this huge problem was finally solved. But then strangest thing happened. This Elder told the pilgrims that he knew about the death of the monk, and he knew because he saw the entire band of angels coming to gather his soul. These pilgrims were stunned. In fact, many thought the Elder was talking about someone else. But this Elder explained to them that this particular monk was born in Asia Minor, during a time when young boys were being gathered up by the Turks. His parents, trying to protect him, would take the young child with them every day out into the fields to work. But in order to keep him quiet, so he wouldn’t be discovered, and to help him sleep, they would put a bit of alcohol in his milk. And so when he grew up, he grew up as an alcoholic. But when he came to the Holy Mountain, he told the Elder of his struggle – of his sin – and the Elder gave him this counsel: he told him to say his prayers, to make his prostrations, and to beg the Mother of God to help him, one drink at a time. After a year, this monk managed—through repentance—to go from 20 glasses of alcohol per day down to 19. The next year, he went from 19 to 18. Finally, after a number of years, he reached only 2-3 glasses per day, but even these 2-3 glasses would still cause him to get drunk. And it was in that state that he died. A drunk, yes. But saved and escorted by angels to the Kingdom (A story of St. Paisios, translated by John Sanidopoulos). 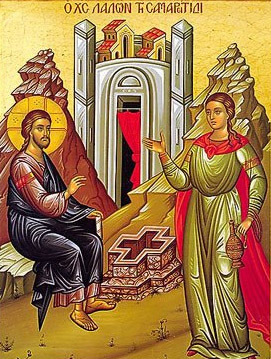 I tell you that long story because it’s really the story of today’s Gospel, it’s really the story of the Samaritan woman. In the world’s eyes, in our eyes, this woman is a scandal. But in God’s eyes, she is a Saint. And that, you see, is what is so profound about today’s Gospel. You and I never know a person’s full story. Sure, we may know bits and pieces, but never the whole thing. We don’t know their struggles, their fears, their worries, and their wants. And, yet, we are always ready to make a judgment, to think of ourselves as better than they, to think of ourselves as not that bad, and to lose focus on our own salvation. But Jesus, who knows all things, is never quick to judge. In fact, Jesus, who knows all things, does not pass to the other side, He does he whisper to his disciples, and He does not shame her for the life she’s lived. No, instead He comes near. He enters into her city and into her life and into her very own heart. And he comes with mercy and love and kindness and forgiveness. He comes to her as He’s come to all of us. And because He has loved us so, He begs us to do the same. Not to dismiss sin as “no big deal,” but to see everyone—every last person who lives, who will live, and even those who have lived—to see all of them as within the loving reach of Christ’s merciful touch. and His All-Holy, good, and life-creating Spirit, now and ever, and unto ages of ages. Amen.